Polderhoek was a small hamlet north of the Menin Road close to the village of Gheluvelt and not far from Polygon Wood. It saw fighting during the First Battle of Ypres in 1914 and then remained in German hands until after the end of Third Ypres in 1917; by that time the whole area was a lunar landscape. Polderhoek Chateau was a medium sized chateau for this area. Little is known about it’s pre-war history but it appears to have been taken over as a headquarters and later a dressing station. 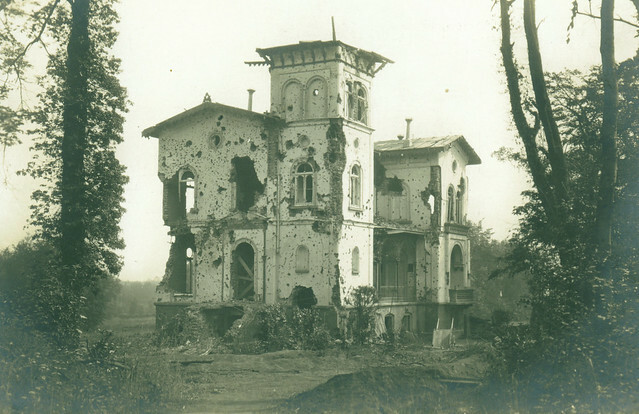 This image dates from 1915 when the building had come under British shell fire – the amount of shrapnel damage to the building is evident by the impact marks on the walls. During the Third Battle of Ypres it had been captured but then re-taken. Men from the New Zealand Division fought a tough and often forgotten battle here in December 1917; most of the dead from this battle are commemorated on the memorial at Buttes New British Cemetery. After the war the owners of the château never returned and thus it was not rebuilt. Today the whole area is covered in an industrial zone. This entry was posted on 06/03/2012 by sommecourt. It was filed under Belgium, Flanders, Great War, Western Front, WW1, Ypres and was tagged with Belgium, Chateau, Flanders, Polderhoek, WW1, Ypres. Comparing the contemporary trench map of the area and the Google earth satellite map seems to show that the industrial zone was built on an area south of the Chateau and Park, which means the former site of the Chateau is actually now in open farmland.